Submitted by savcash on Wed, 04/27/2011 - 01:17. The Fed chairman is holding the first scheduled press conference in Fed history tomorrow. --snip--Tomorrow, the notoriously close-mouthed Federal Reserve is holding the first scheduled press conference in its entire history. 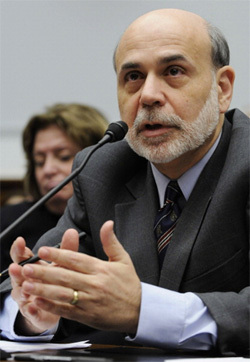 As part of a push for transparency and public approval, Fed Chairman Ben Bernanke will now submit to media questioning four times a year, following meetings where the Federal Open Market Committee updates its economic outlook. Will the dollar tank even more after this meeting? Going below 76-73 cents? and http://thecomingdepression.blogspot.com/ how the fed could kill the dollar tomorrow. But of course, they are really good at not giving up much information. And, one has to wonder, is there more then one set of books?? Submitted by savcash on Wed, 04/27/2011 - 02:39. On April 21, 2010, the US Government announced a heavily redesigned $100 bill that featured bolder colors, color shifting ink, microlenses, and other features. It is scheduled to start circulating February 10, 2011. It will cost 11.8 cents to produce each bill. "The soundness of a nation's currency is essential to the soundness of its economy. And to uphold our currency's soundness, it must be recognized and honored as legal tender and counterfeiting must be effectively thwarted," Federal Reserve Chairman Alan Greenspan said at a ceremony unveiling the $20 bill's new design. Prior to the current design, the most recent redesign of the U.S. dollar bill was in 1996. "Mr. Chairman, we have in this country one of the most corrupt institutions the world has ever known. I refer to the Federal Reserve Board and the Federal reserve banks. The Federal Reserve Board, a Government Board, has cheated the Government of the United States and the people of the United States out of enough money to pay the national debt. The depredations and the iniquities of the Federal Reserve Board and the Federal reserve banks acting together have cost this country enough money to pay the national debt several times over. This evil institution has impoverished and ruined the people of the United States; has bankrupted itself, and has practically bankrupted our Government. It has done this through the misadministration of that law by which the Federal Reserve Board, and through the corrupt practices of the moneyed vultures who control it". Submitted by savcash on Thu, 04/28/2011 - 11:51. Keep your eyes on these charts, (as they are changing to keep up - or down) everyone is saying this is going to be a real bumpy ride. If you have any extra funds, trade those FRN (federal reserve notes) into gold or silver is also the advice of many. Silver has outperformed most of the other precious metals, what, over 60% just since Jan? REALNEO has experienced childish abuse of front page posting and now polls--should polls be eliminated?